?What is "arbitration" in a crop insurance claim? ?What is "adjusted growth revenue" insurance? Posted on 04/05/2019 Agricultural Law in South Dakota - It's a Big Deal! Swier Law Firm recently published a new book titled Estate Planning for Farmers and Ranchers in South Dakota. Scott Swier and Jake Fischer, Chair of Swier Law Firm’s Agricultural Law Practice Group, co-authored the book which explains important estate planning concepts for agricultural producers in a logical and user-friendly style. 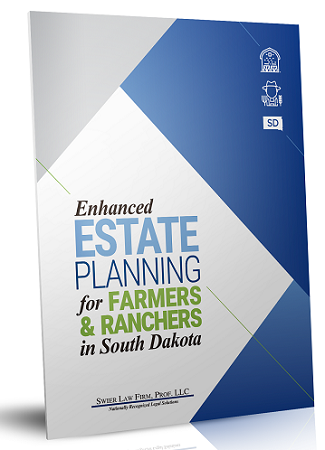 As with the other books in Swier Law Firm’s popular series, Estate Planning for Farmers and Ranchers in South Dakota is updated to reflect recent changes in this complex area. Do you really need an Estate Plan? What is a Last Will & Testament and what does it do for you? What is Jointly-Owned Property and Financial Accounts? What are Powers of Attorney and Living Wills? 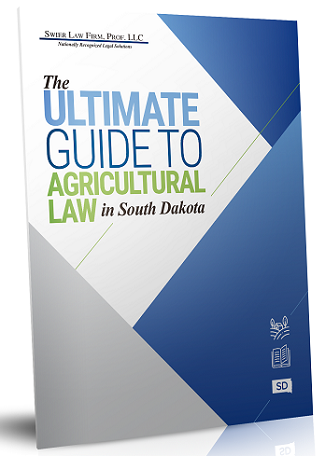 Get Your Free Book "What You Need To Know About South Dakota Agricultural Law"
Preparing, Revising and Updating Farm Operation Governance and Compliance Materials, including Bylaws, Committee Charters, and Compliance Policies. Take a look at our valuable agricultural law books and articles. Our materials are full of tips and advice. All materials are written by the law firm's nationally recognized agricultural law attorneys and provide detailed South Dakota-specific information designed to help anyone with agricultural law issues. You can request your free copy by clicking on the book cover below.